Don’t be fooled by the hype of SharePoint 2010. Be aware that what you are shown in sales meetings, demos, conferences and bootcamps are usually built on Enterprise Features of SharePoint 2010 (using Office 2010 and IE8). Those come at a price, so do your homework on what you need and what each version has to offer. Foundation has more than enough features for the average small business, so look into hosting options on this if you don’t have your own servers yet. For large organisations thinking about or using Enterprise licensing, just remember that many of those features require external consultants who have the relevant experience and expertise to set them up and leverage; as well as dedicated internal teams to manage. However this is true for Standard licensing now as well. SharePoint 2010 is so big and powerful, attempting to gain benefit from every single feature is not going to be viable unless you have 25 dedicated SharePoint technical and business user resources. (Think of Word, you don’t use every single feature do you, but you still gain massive value from it). Take a phased approach, go slow; and plan, plan, plan. And call in the specialists when necessary, it can save you years of work. The 3 basic versions for intranets are Foundation (WSS4.0), Standard and Enterprise CALS, (Client Access Licenses – licensed on a per user basis in other words). SharePoint 2010 has gotten smarter with monitoring who’s using what feature, so make sure you’re legally licensed. Don’t try and figure out how much your licenses are going to cost you. The SharePoint licensing model is extremely complex and has many dependencies. Speak to your Microsoft product manager about options. 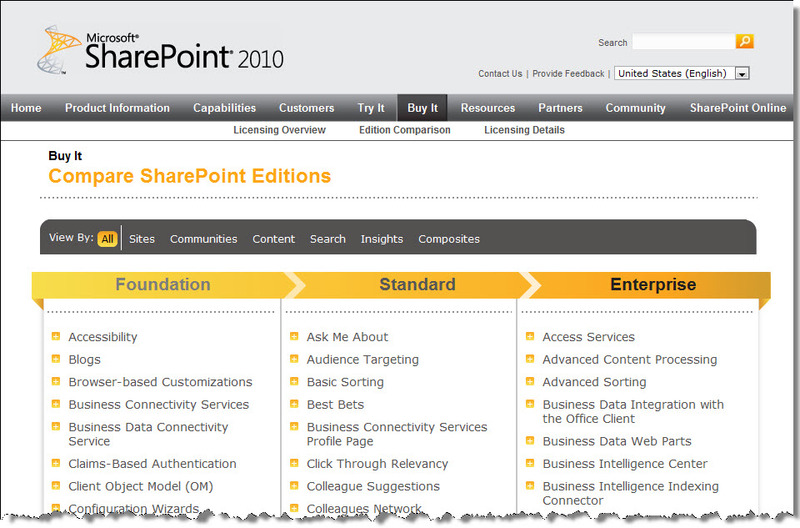 The full breakdown of what each version can do it beautifully demonstrated on the official SharePoint 2010 website.